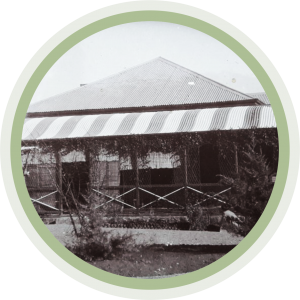 Barts, who started farming at Hillside in 1909, planted hundreds and hundreds of trees, and constructed stone walls around the farmhouse garden. Len and Denise were pioneers in veld management and had the existing farmhouse built during the wool boom of the 1960’s. Denise was a well-known agricultural journalist, and a very keen gardener. Des and Wyn, both veterinary surgeons by profession, brought Thoroughbred Horses to the farm, which were Des’ joy and passion. They also made a concerted effort in re-establishing and improving our Red Angus stock. Currently Ian and Kate, and their three sons, Joshua, Luke and James have the privilege (and the challenges that come with it) of living at Hillside. Ian has undertaken ambitious renovations and extensions to the main house. Restoration of some of the old buildings, as well as improvements to staff housing have been carried out under Ian’s meticulous planning, care and direction. This is an ongoing process. 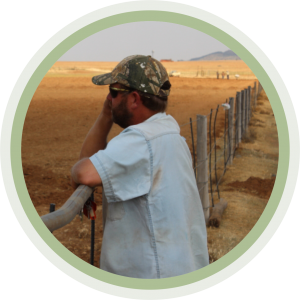 Presently, day-to-day farming activities are overseen by Nico Nel, who, with a loyal team of workers always have plenty of jobs requiring their attention. Nico is from Cathcart in the Eastern Cape and has a dog named Chip. He loves rural farm life and enjoys braaiing, carpentry and hunting. A more agreeable and obliging person would be hard to find! Sisters, Paulina and Lydia Chapie, are indispensable in running the guest accommodation. They have been living and working on the farm for many years. 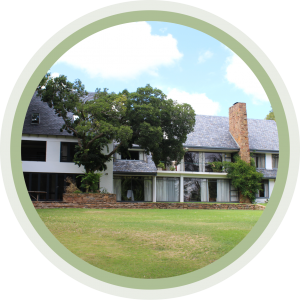 As our own children have grown up and become more independent, Paulina and Lydia’s focus has increasingly moved towards facilitating the accommodation of visitors. 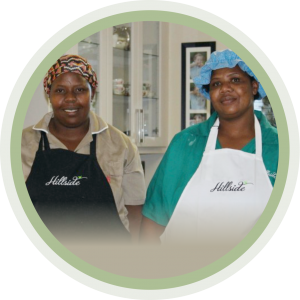 In addition to their responsibilities of preparing for, meeting, greeting and ensuring our guests are comfortable and served with tasty home cooked meals, they also see to the needs of their own children and Lydia is studying towards her matric qualification.